Besides a good feature rich product and amazing support; Product Documentation also plays an important role in terms of customer satisfaction and revenue. If there is no documentation available on the product site, customers will be forced to raise a support ticket. Getting response from the support team may take some time and it may delay customer’s work. Self help guides allow customers to go through frequently asked questions and general queries and help them resolve small issues by their own. A good documentation contains easy navigation and clean layout with better readability. Step by step explanation with screenshots helps too. In this article, I will showcase some user manual examples or product documentation example to help you set a good goal. 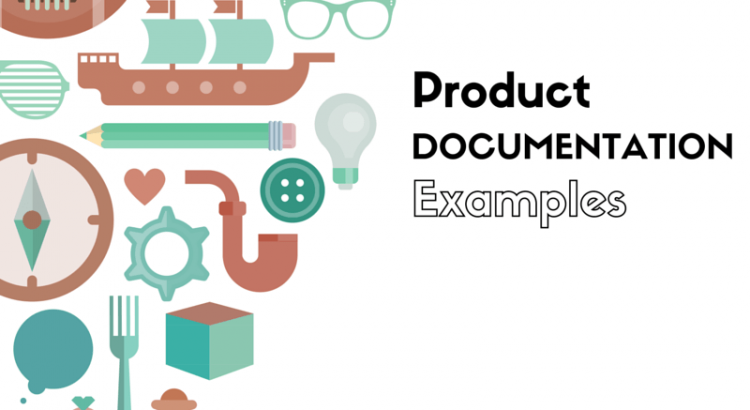 If you are thinking that, creating a product documentation or online user manual is a very technical thing, I would recommend to read this Ultimate Guide to Create Product Documentation. A good documentation will speed up your product’s sale as well as improves SEO too. Before creating a good product documentation guide, it is always better to see some inspirations. I have listed some of the best user manuals and product guide examples in this article to inspire you enough to start making your own. 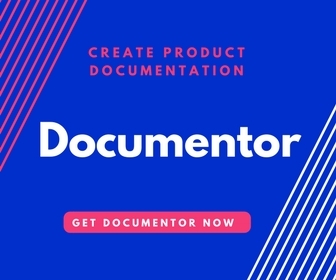 Many of these examples are of popular product sites and you may think that building such documentation will be a costly and time consuming task, but please read till the end as I have listed some simple ways to build similar documentation. Stripe is one of the well known payment gateway used by many merchants. It allows individuals and businesses to accept the payment easily over the internet. I have gone through the documentation that was offered by them and I should say that the way it was represented was in a clean and easy to understand by the visitors. The API documentation that was offered by them was really amazing. There was a Syntax highlighter that was used, that allowed to display the source code in different colors as well as fonts. Towards the left there were different topics that were listed by it. If you are planning to build a website related to API or where the source code is give much importance than definitely you should visit the documentation that is offered by stripe. The way the documentation for it was represented was commendable. There were different topics or the categories that were listed towards the left which is indeed eye catching for the visitors. MailChimp is an email service provider that allows you to create, send as well as manage email newsletters. The documentation that is provided by them is very eye catching. 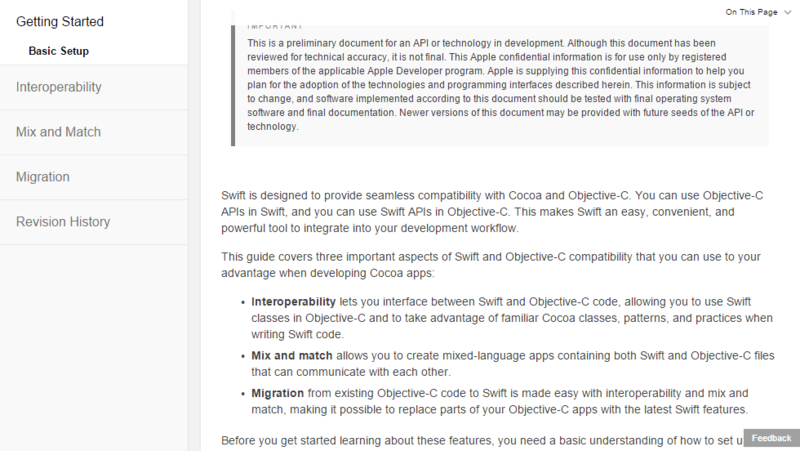 It allows to add the links for the documentation along with Syntax Highlighter. Towards the left there are different sections that are displayed for the guide and there is different URL for each of the section. 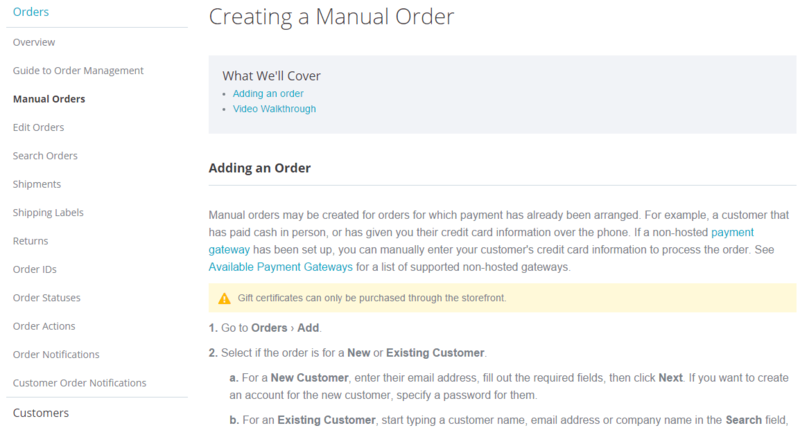 The documentation provided by MailChimp is displayed in very appealing way also all the points and instructions are mentioned very clearly. It will help you for the optimization of the site and also provides with the complete solution for SEO. Yoast provides with clean documentation, below each document there is a contact us form that allows to contact the support team in case of any of the queries. It also provides with a proper pagination along with all the categories that is listed towards the left. One can easily locate the category through the Search option present towards the top. It will also provides with the information when the document was updated lastly. After going through the documentation that is offered by Microsoft, it is very appealing for the visitors. It includes videos and images along with the documents that allows the visitors to have a better understanding. There are different sections for each of the category and there is an in-depth documentation that is provided by it. 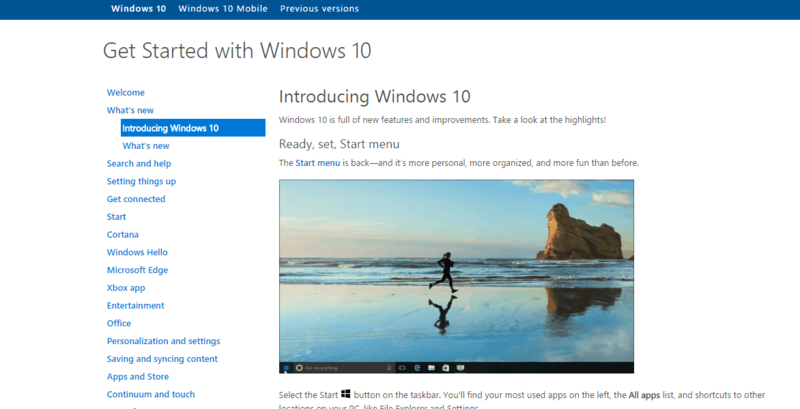 The thing that makes the documentation of Microsoft to be very appealing is the images and screenshots used by it. As images are always worth a thousand words. The way in which the documentation of Apple is present is really amazing. There are different points as well as instructions that are covered in the guide that is offered by them. Towards the bottom it provides with the feedback option where the visitors can share their views regarding a particular document. Also the users can add the suggestion in order to improve the particular document. There are also screenshots that are included to have a better understanding of the document that is provided. The guide for ionic is represented in a very elegant way with the linking to the next documentation towards the bottom. Each of the topic is distinguished by different chapters and there are different icons that are represented for it. There is a sticky sidebar towards the left that is provided by it. There is a search option that is present at the top that will help to search a particular document very easily. The document is represented in such a way in order to make it appealing for the visitors and also it is very easy to understand from the perspective of the visitors. 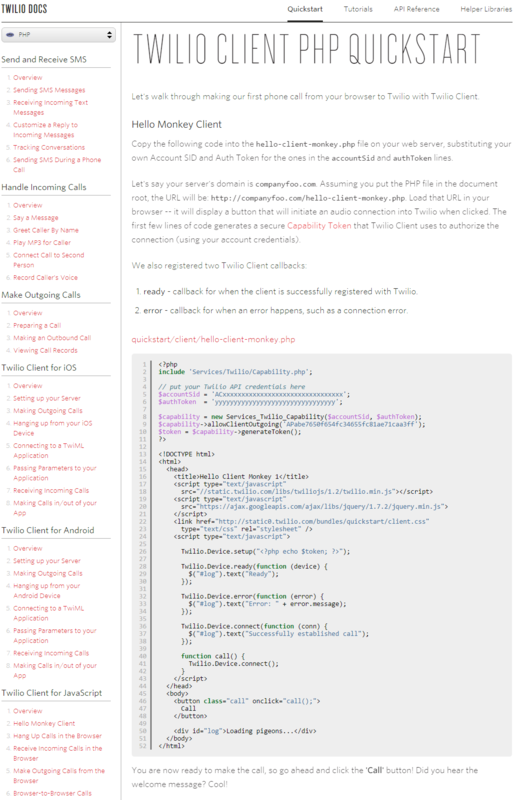 The guide that is provided by Twilio is easily categorized into different categories. There is a Quickstart, Tutorials, API Reference and Helper Libraries that is provided by it. Towards the left it consists of all the sections that gets displayed based on the category that is selected. There are also different links that are provided by the particular doc and also consists of the linking to the next document. There are large number of sections that are added for each of the document that helps to have a better understanding. In case of any of the source code there is a Syntax Highlighter that is used for it. The user manual or documentation that is provided by Skype can be considered as a step wise manual with a complete understanding of the query that you are struck. Towards the top, it displays the count for the total number of articles. And there are different articles that are belonging to the particular category. There are different images and screenshots that are displayed for the particular doc. Towards the bottom there is an option that tells that whether a particular article is helpful or not. The way in which each of the step is displayed, makes it easy for the visitors to have a better understanding. 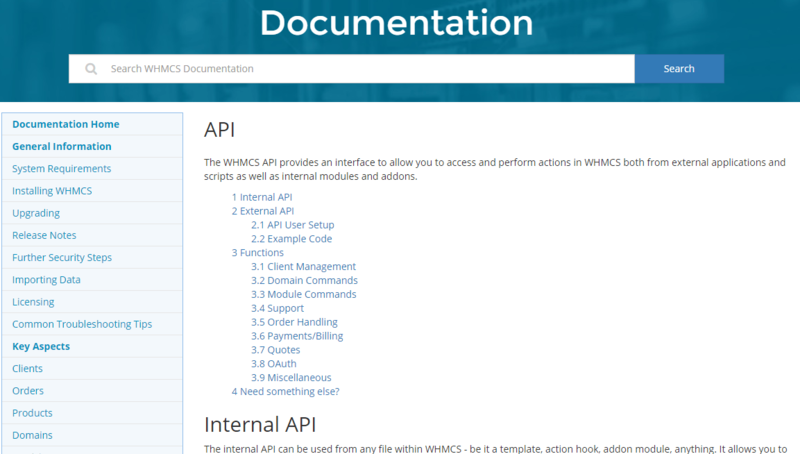 The documentation or the manual of WHMCS gives you the clear vision of the document that you are searching for. On the Home page of WHMCS there are different topics that are listed and one will easily find the document that one is looking at through exploring the following topics. Towards the top it will list out the topics with different sub sections. Under the documentation there is a separate topic that is present for the Community forums. There is a step wise explanation given for each of the topic for the How To Guide. There is also a proper linking that is given for each of the topic. The user manual that is provided by Blesta provides with a very good documentation that is indeed very simple and easy to understand. There is a separate guide that is prepared for the Users as well as Developers. As there are lots of sections that are present under a single topic, so towards the bottom it gives you the option to Show More. For each of the topic, it gives the details of the writer along with lastly the particular document was modified. There is a Navigate space that is present towards the right where one can search the topic that one is looking for. There are also breadcrumbs that are provided for each of the page that helps the user for the easy navigation. There is a tree like structure that is provided by this document. The manual that is provided by BigCommerce is designed and presented in such a way to attract the visitors to the site. There are also links that are given for Chat and Community Forum in order to contact the support team in case of any of the queries. It also allows the user to give the feedback whether the following topic was useful for the visitors or not. The documentation also provides with different links in order to help the user to have a better understanding when they are referring to a particular topic. The manual lists out all the topics along with the count and sub topics for each of the topics. On clicking on the particular topic the user will be redirected to the page that one needs to refer. Towards the right, it will list out all the related articles along with the option to print the particular article. There are also different links that are added for each of the topic, it also allows to get the feedback from the visitors whether the topic is useful or not. It is written in very appealing way to attract the visitors and that will keep them glued to the guide. There is a different section that is present where the visitor can directly download the guide and go through it whenever required (for the offline reading). If you are planning to build one such documentation for your website than this can be achieved easily through WordPress. I would recommend to read this Ultimate Guide to Create Documentation to easily build and publish a beautiful guide just like the mentioned user manual examples. 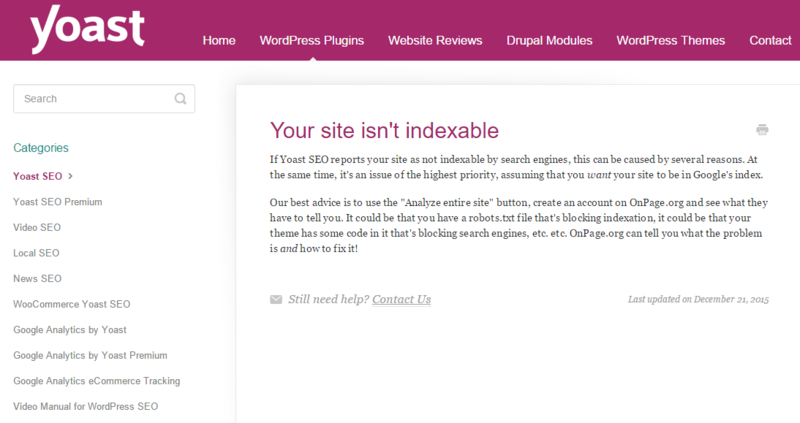 I have listed few free plugins to create documentation and along with that, check some WordPress Themes to implement a nice design. For the offline reading it supports Save as PDF option. It allows the users to submit feedback for any of the documentation section. There are multiple skins that are supported for it to make it appealing for the visitors. There is also a print option provided in order to print the particular manual or guide. As Social Media plays a very important role for building of any of the site, so it supports Social sharing option. There can be number of sections and subsections that can be added for the particular document. It also allows you to embed the videos, Google maps and tables very easily with it. Full control over the settings panel in order to change the color as well as fonts. These are just of few of the features offered by Documentor plugin. This plugin is bundled with so many great features in order to create a perfect document for your site. A good documentation will definitely help you to increase the sale of the product. Moreover the content, images, screen shots and videos that are included while creating a document also plays a very crucial role. All the features that are provided will surely help you to build a document of your choice. Hope this post will help the users to build a better documentation and help guide for their site. I like exploring new topics related to technology and implement my own ideas to make it much simpler for readers to understand. In leisure time I like to spend time with my good close friends and family.